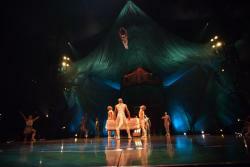 For the first time in 7 years Cirque du Soleil returns to St. Petersburg with a big top production, KOOZA! The critically-acclaimed show opens Thursday, Nov. 8 for a limited engagement under the Big Top at Tropicana Field in St. Petersburg. Tickets are now on sale and can be purchased at cirquedusoleil.com/kooza. The show starts with The Trickster bursting onto the scene like a jack-in-a-box right in front of The Innocent, and that is just the first of many surprises to follow. The Innocent’s journey brings him into contact with a panoply of comic characters such as the King, the Trickster, the Heimloss, the Pickpocket, the Obnoxious Tourist and his Bad Dog. Between strength and fragility, laughter and smiles, turmoil and harmony, KOOZA is set in an electrifying and exotic visual world full of surprises, thrills, chills, audacity and total involvement. 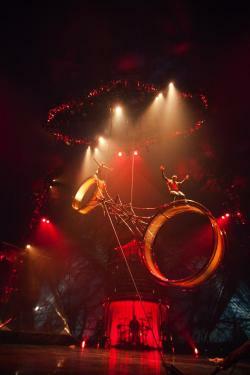 Several of the 53 performing artists in the show have received awards from important circus arts competitions. The show presents an unprecedented approach to the High Wire and a breathtaking Wheel of Death – an act that Cirque du Soleil has never before presented under the big top. You don&apos;t want to miss the show they are calling "An adrenaline rush of acrobatics in a zany kingdom"! Stay tuned for more fun things to do this weekend in Tampa Bay!